Everyone is invited to join us to blog hop and to share where you are from, it will be fun to meet bloggers from all over the world! Where in the World are you? 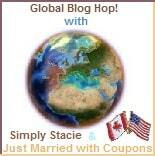 Please join your Hosts Simply Stacie who lives in Nova Scotia, Canada and Just Married with Coupons who lives in Rhode Island, US on a fun blog hop adventure around the world. Tell us as anything you would like, what country, state, city or region you are from, lets have fun! Where in the World is Acting Balanced? It is estimated to be in excess of 1400 years old, stands 65 ft (20 m) tall, measures 28 ft (8.5 m) in circumference, and shades with its crown an area of 17,000 square feet (1,600 m2). It's widest crown spread point-to-point is 180 ft, which is longer than any other live oak in the country. Its longest limb is 105 feet (32 m) in length.